San Leandro City Hall is located at 835 East 14th Street, San Leandro CA 94577; phone: 510-577-3200. Photo: Casa Peralta, ca. 1910, 384 West Estudillo Avenue, San Leandro, CA. Listed on the National Register of Historic Places in 1982. Photographed by user:User:Sanfranman59 (own work), 2008, [cc-by-3.0 (creativecommons.org/licenses/by/3.0)], via Wikimedia Commons, accessed May, 2013. The San Leandro area was home to Native Americans for more than 3,000 years before the first European settlers arrived. Very few traces of the native inhabitants remain today, but evidence from nearby sites and early records provides a picture of what life was like in the area prior to the arrival of Spanish explorers and missionaries. At least 10 archaeological sites have been identified between San Leandro Creek and San Lorenzo Creek, most consisting of remnant shell mounds near the Marina and along the banks of the creeks. There are also few remaining traces of the first 100 years of European settlement in San Leandro. A variety of Early California architectural styles existed in the town during the 1850s and 1860s, but virtually all of these structures were lost as a result of earthquakes, fires, or demolition. 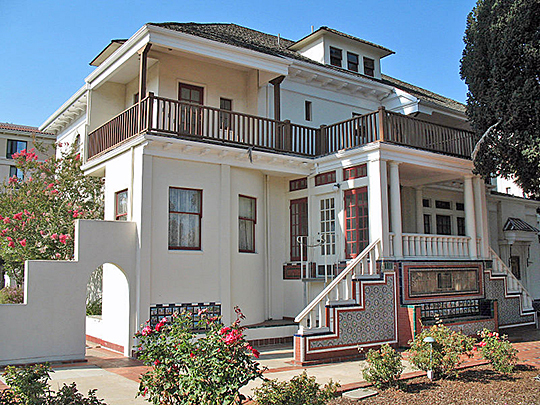 The only structure still standing in San Leandro confirmed to pre-date the City's 1872 incorporation is the Alta Mira Club, constructed in 1860 and located at 561 Lafayette Avenue. That building, originally the home of Ignacio Peralta, has been a designated California Historical Landmark since 1937 and has been on the National Register of Historic Places since 1978. There are several dozen structures in the City built between 1870 and 1900 that are still standing. Most are residential buildings built in the vernacular or Victorian styles that were popular at the time. The Daniel Best Home, an Italianate Victorian built in the late 1870s at Clarke and Estudillo, is probably the best example. Elsewhere in the City, there are a few examples of Queen Anne, Second Empire, and Italianate homes, generally scattered to the southeast of Downtown. Another concentration of turn-of-the-century vernacular homes can be found along Orchard Avenue between Davis and Williams Street. These homes are notable for the community of Portuguese settlers that once resided there. City of San Leandro, California, General Plan 2002, updated 2011, Chapter 7, Historic Preservation and Community Design, www.sanleandro.org, accessed August, 2013.